These sites are maintained by Eric Stuve. OK 74E South assurance shield just west of OK 74. The 5-mile-long highway is signed north-south in its entirety, although it spends most of its route going east-west. Changes are coming soon to OKHighways.com. To preview the new home page of OKHighways.com, please click here. The page will open in a new window. I would appreciate any comments and suggestions. On January 9, 2006, the Oklahoma Department of Transportation approved a change of the state highway shield. 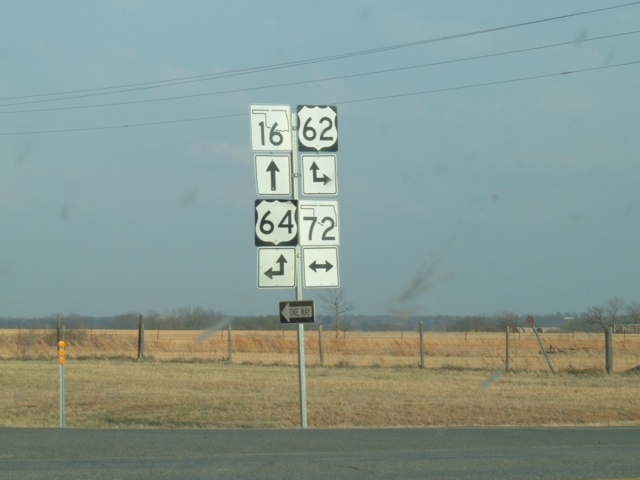 All state highways will be signed with the number on top of an outline of the state of Oklahoma. The top part of the numbers will be placed over the bottom 1/3 of the state outline. According to ODOT, shield replacement started in late January and may be finished by the end of the year. This new design replaces the current circle design (like seen above in the picture of the week). Stay tuned to OKHighways for pictures of the new highway shields when they are erected in the near future. Update June 7: As promised, a checklist of new state highway shield sightings/photographs is now available on the website. Update May 17: By the end of this week, I hope to post a checklist of state highway shields that have been seen by others and reported to me and/or have been photographed by me. It appears that new state highway shields have popped up in southeast Oklahoma, and have also made it through much of the Oklahoma City metro area. Update May 3: In the past week, I have received e-mails about new state highway shields along OK 9 near Interstate 35, along OK 74B near Goldsby, and along Britton Rd. at OK 74. Just today, during the time I was at work, the OK 3 shields were replaced along Shields Blvd. in SE Oklahoma City at the Interstate 240/U.S. 62/OK 3 junction. As of tonight, the OK 3 shields along S. Western at Interstate 240/U.S. 62/OK 3 have not been replaced yet. But it appears that much progress is being made. I just don't know when I'll get outside of the OKC area again to see the new highway shields! 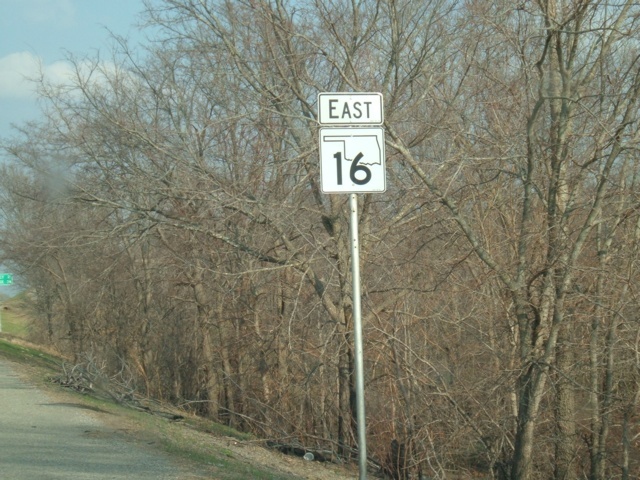 Update April 1: During a trip along the U.S. 75 corridor on March 31, I spotted about 18 new state highway shields, mostly along OK 16 between U.S. 75 and OK 52. Other new shields I saw were on OK 117, OK 56, and OK Loop 56. 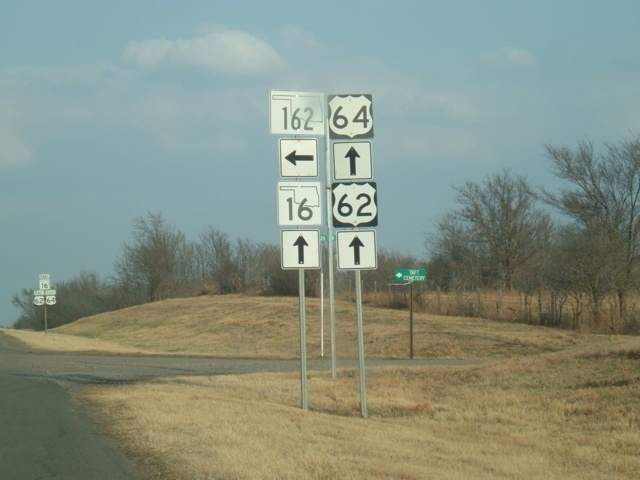 So it appears that if you want to see any new state highway shields right now, take a drive along U.S. 75 between Okmulgee and Tulsa, or OK 16 between U.S. 75 and Muskogee, because that is where they are at right now. I did photograph the new shields and the pictures will be on the respective webpages soon. Many thanks to Travis for getting these pictures! All pages and pictures (C) 2004-2006 OKHighways.com. I am not affiliated in any way, shape, or form with the Oklahoma Department of Transportation or the Oklahoma Transportation Authority. If you would like to use a picture from this site, please e-mail me with your name, webpage address, and reason for using the picture. You must receive a confirmation from me, Eric Stuve, before you put my picture on your site. All I ask after that is that you credit the photographer (me) and place a link to OKHighways.com somewhere on your site. This site is not Jeff Kitsko's OHHighways.com page, covering the highways of the Buckeye State. In case you mistyped a letter in the URL and ended up here, click here to go to OHHighways.com.